Posted on April 25, 2019 | by Seven | Leave a Comment on Are women different? In some ways, it’s a trick question. When you build bikes one-at-a-time for the person who will ride them, every one of them is different. But asking how women, as a general category of rider, are significantly different than men is a good way of understanding the particular value of a custom Seven. Again generalizing, women vary more in body proportion than men do. A woman of average height will have an inseam measurement that falls in a much wider range than a man of average height. Reach varies wildly, too, and those are just two of the more critical ways we think about fitting a person on a bike. It is also true that the industry doesn’t make stock sizes small enough for a fairly large percentage of women. In fact, most women who don’t conform to the averages (and there are more of them than there are of men) have never ridden a bike that BOTH fits well and handles well. To make a stock size bike fit well, radical adjustments may need to be made to stem length and/or saddle position, and the result is overwhelmingly a bike that is too twitchy, not much fun to ride. At Seven we control the variables. Bottom bracket drop, head tube angle, fork rake, not to mention seat tube length, stem length, etc., it all feeds into what will be a great riding bike for a rider of any proportions. Women are not different in the sense that they want to feel confident on the bike. For far too many, a stock bike won’t get them there, and their cycling experience will be compromised. We take great pride in being able to deliver exactly what they need, regardless of size, proportion, or preference. First the photo, this one worth 2,000 words, we think. Even without any context, we found ourselves wondering, if you could ride a bike there (where?) why would you ever ride anywhere else? If you’re looking for the spot, it’s at the Ceide Fields a Neolithic field system in Mayo, Ireland. We met Noel, the rider, through our friends at Cyclefit in London. Noel is an accomplished audax rider from Ireland, and we painted his Axiom SL to match his favorite place to ride, as well as to honor Audax Ireland. The photo was taken during the Connaught 600, a 600k event by the organiser of the Wild Atlantic Way Randonee. This photo was taken on the road to Lake Garda, in Italy, last year. The bike is an Evergreen Scrambler. 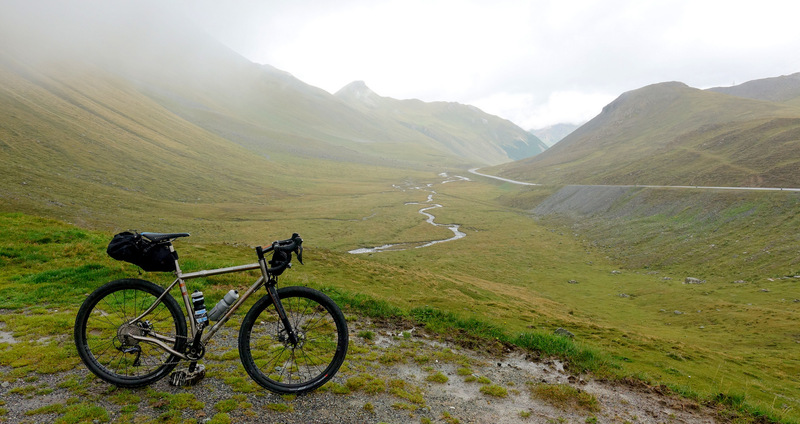 This is a long way in both time and space from the introduction of our first new dual-suspension bike in a decade, but this is how bike design is sometimes. This story starts with a vacation. Strictly speaking, we had been working on ideas and working through the preliminary engineering math for a new dual-suspension design for about two years, but it was a trip to the Mountain Bike World Championships in Lenzerheide, Switzerland that catalyzed the real work behind the bike that would become the Mobius SL. Ironically, we flew into Venice, a city where you’re not allowed to ride a bike, before making our way north to Lake Garda for a few days of riding before the races in Switzerland. The lake is surrounded by old stone architecture, sweeping green vistas, and perfect dirt roads. We spent hours crisscrossing the vineyards there, occasionally daring to point our noses up the precipitous climbs that snake away in every direction. It is always inspiring to encounter the rawness of nature via bike, and Lake Garda served up a huge does of inspiration. The four hour drive to Lenzerheide took us past seemingly endless green pastures and more road climbing than our legs will get to in this lifetime. In Lenzerheide, the long arch of product development began. It might seem like fun and games watching the best racers in the world doing impossible and exhilirating things in the dirt. We spent hours looking at bikes designs, suspension kinematics, prototype components, and how various suspension approaches worked and didn’t work in all kinds of terrain, traction, and trail conditions. Seven’s new suspension platform, the Balance Control System (BCS), is a direct result of exploring every aspect of how racers and riders use their bikes in all kinds of conditions. Professional level racing is one part of the spectrum. BCS is a design platform for custom dual-suspension bikes, which lets us bring the same level of rider-specific tuning to suspension performance we bring to road feel. It incorporates the proven, workhorse, four-bar linkage system and updates the kinematics for today’s mountain biking styles, not to mention our ability to customize and tailor bikes in unique ways. We launched the first BCS bike, the Mobius SL at NAHBS, because who wouldn’t want to build show bikes AND release a new model for the same event? 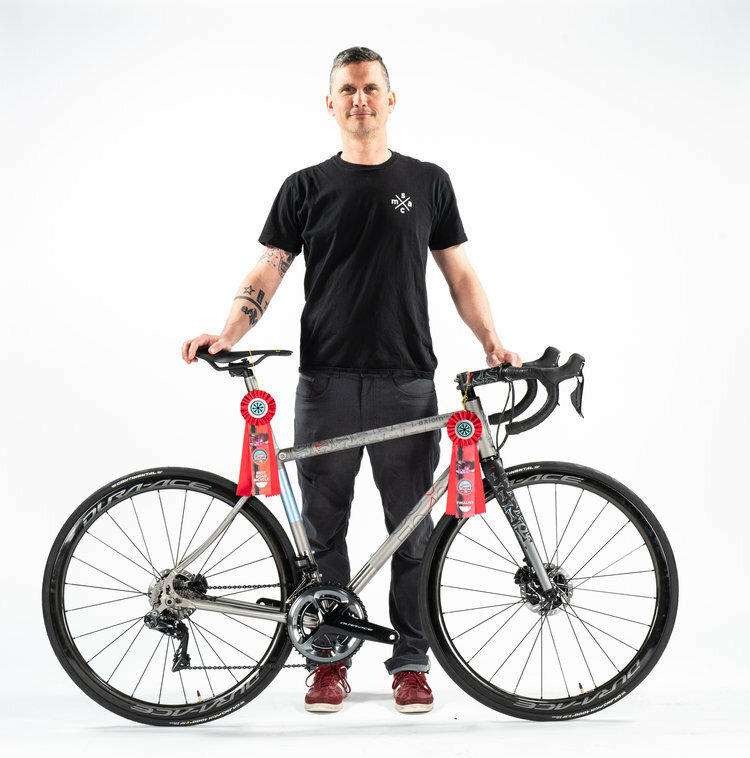 In addition to the ribbons we won for Best Road Bike and Best Gravel Bike, the Mobius SL was also a finalist for Best Mountain Bike, so as crazy as months have been leading into Spring 2019, it has all been very worth it, and we returned from Sacramento with smiles on our faces and a feeling of proud satisfaction. Check out the Mobius SL show bike, or see which Mobius might be right for you. All of that leads up to the second BCS dual-suspension bike, the brand new KellCat SL. 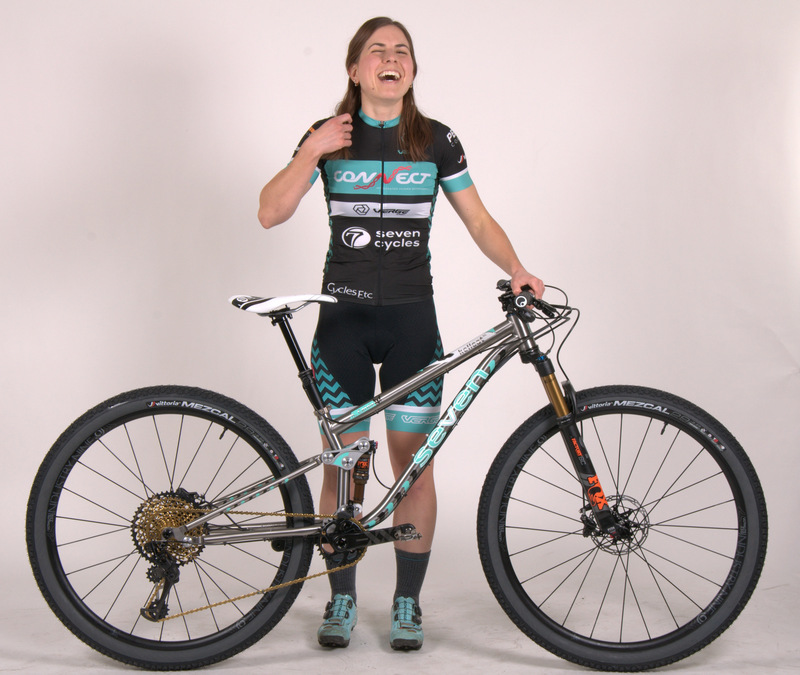 KellCat is a collaboration project with pro mountain bike racer Kelly Catale, who came to use looking for the fastest cross-country, dual suspension 29er we could make. 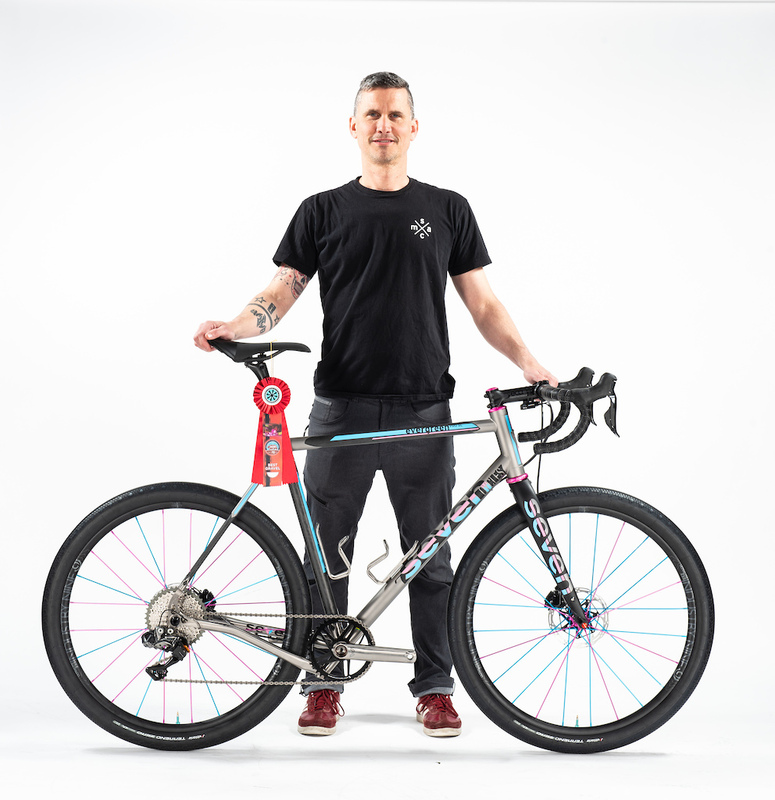 Kelly worked with us through the first two prototypes of this bike, and after coming to understand her riding style and settling on her race geometry, we immediately set about machining the solid aluminum rockers for this bike. Like the Mobius SL, the KellCat SL is hand-crafed at the deepest level, from the dropouts through the rockers, and up through the double-butted titanium frame. KellCat SL launches right now! 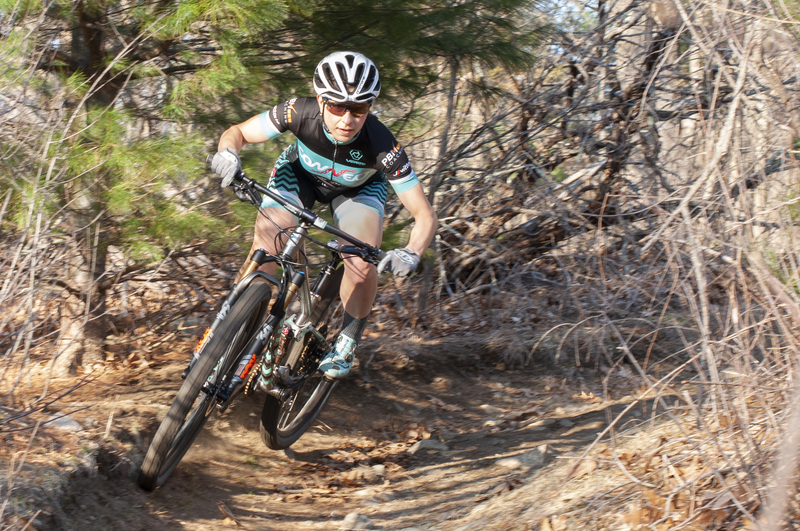 Kelly will race it at Sea Otter this weekend, and we’ve put together a few different versions of her bike that you can order now if going fast on tight, technical terrain is your idea of fun. See the KellCat SL in three different builds now. Posted on April 17, 2019 | by Seven | 1 Comment on It’s Not Art. Unless It Is. People sometimes say our bikes are art, and that they should be hung on a wall. We very much appreciate the sentiment, but emphatically disagree with the practice. Bikes are for riding, and we hope every one of our riders is out on the road or trail at every opportunity. We met Kevin W at NAHBS last month, and his wife, after teasing him about how much he loves his bike, went one step further and turned his Seven into actual art. This seems, to us, like a solid compromise.